Besides blogging and my work as a stay-at-home mom, I also volunteer at our church. Right now we are in the process of setting up a children's play area, a place for children to play during bible studies and other activities. I had been searching for a rug for this area for a for a few months but still hadn't purchased anything yet because we were waiting for some funds. So, you can imagine how surprised I felt when CSN rugs contacted me last week asking if I would like to write a giveaway or review post about their area rug selection. Through blogging I've become aware of a lot of great companies and products. But this newest opportunity came at the perfect time. Indeed, the Lord knows our needs and provides for us each and every day! Very soon the children in our church will enjoy playing on this beautiful L.A Rugs Supreme Streets Rug. 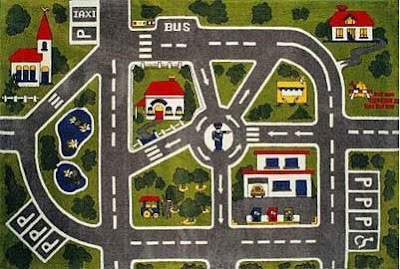 Notice the church on the upper left; the manufacturer didn't forget this important part of the town in this road play rug. CSN offers a wide range of rugs including many, many kids area rugs. Look forward to my upcoming review of CSN rugs and see a picture of the actual rug in the play area. In the meantime, I thought you might want to enter some of these great contests for the chance to win your own CSN area rug! I like the round-a-bout and the handicap parking spot too. It looks like the roads on here will be nice size for even big toddler cars (vs. small hot wheels cars).